It’s almost that time of year again! 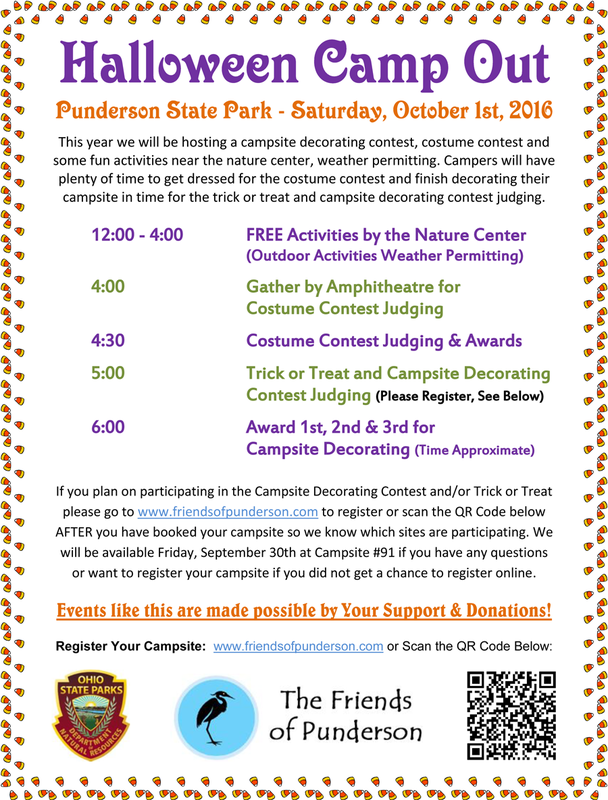 Coming up quickly this year is the Halloween Camp Out at Punderson State Park! Now is the time to Reserve your Campsite and make sure to Register Your Campsite to let us know that you will be participating in the Campsite Decorating Contest and Trick or Treat! We will also have a Costume Contest and activities by the Nature Center! We will be at Campsite #91 (right behind the nature center) Friday, September 30th & the morning of Saturday, October 1st if you have any questions prior to the festivities. Please book your campsite for Friday, September 30th – October 2nd (two night stay) to be able to fully participate in this event! If you arrive Saturday morning you may not have enough time to decorate your campsite!